We are very pleased to offer, arguably one of the most important bikes of the late 60’s / early 70’s in showroom condition. 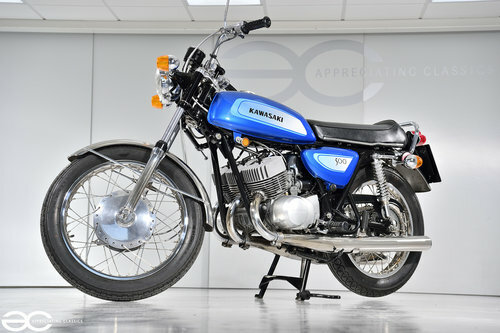 This 1971 Kawasaki H1A is in beautiful restored condition, utilising original parts. 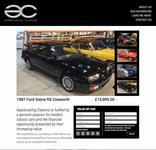 Over £17,000.00 in receipts with Rising Sun Restorations. An iconic muscle bike that is in fantastic order and is more than worthy of any collection. In the 1960’s, a war was brewing and Kawasaki wanted to perform a knockout blow to the competitors. 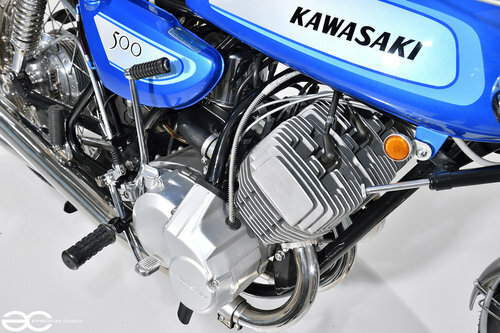 With the release of the Kawasaki Mach III H1, it delivered that blow – with a lightweight chassis, and a 3 cylinder two stroke engine producing 60bhp. Now by today’s standards, 60bhp is not a huge amount by any stretch, but consider this – in 1969 – a two stroke motorcycle, which would scream the 1/4 mile in 13 seconds! It is fair to say that Kawasaki played a large part in moving things forward with the Mach III H1! 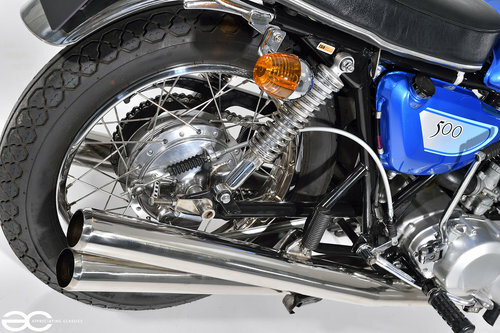 1971 saw a few minor changes, including the model name becoming H1-A, alongside revised damping for the forks and rear shocks, a different shaped fuel tank and various other minor improvements. 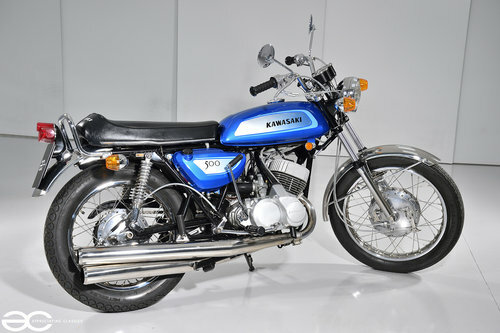 This particular Kawasaki H1A was brought in to the UK in 2010, and underwent a full restoration at huge expense. 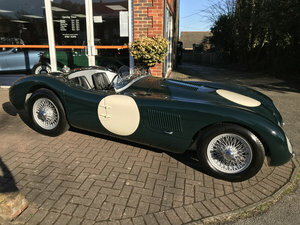 Within the history file are invoices from ‘Rising Sun Restorations’ amounting to over £17,000.00, ‘Rising Sun Restorations’ are one of the most highly regarded specialist’s in the industry. Also present are MOT’s, and a ‘Classic Bike’ magazine with the bike shown in a pre-restored state when the bike was bought by its previous owner (the owner of Rising Sun Restorations). 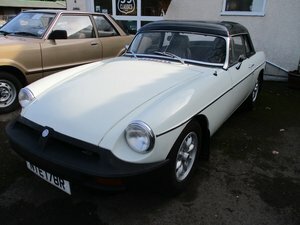 Original panels are still fitted, and have undergone a full repaint in the original colour scheme as part of the comprehensive restoration. The finish of the paintwork is very good indeed, and looks simply beautiful in the blue. As part of the restoration, the frame and swingarm were of course re-finished and they still present very well, and are without any damage. 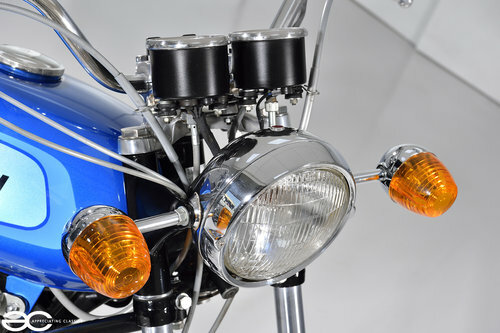 The same can be said for the headlamp brackets, bottom yoke, and rear light cluster. It is also to be noted, that the speedo and rev counter were fully refurbished (mileage not reset) as part of the restoration, these look superb, and the casings are again, without any damage. 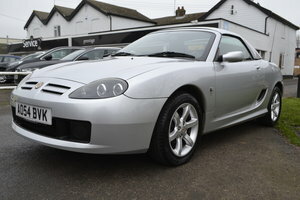 All trim is in superb order, either being replaced with new old stock parts, or having been fully refurbished. Points to note, the stainless side trims on the seat are present and in good order, the original exhaust system is still in place, as are the original stamped wheels. This is not to be confused with other examples which have various incorrect or re manufactured parts fitted. As can clearly be seen from the pictures, all of the chrome trim is all in very good order and is without corrosion, as are the polished aluminium parts. You will notice that the correct original headlamp and indicators are fitted, which are in great condition, as is the brake light. Original switchgears are still fitted, and everything works just as it should do. With only 815 miles being covered since the comprehensive restoration, this H1-A still presents extremely well indeed. Somewhat of a legendary engine, what we have here is an air cooled 498cc, three cylinder, two stroke which produces 60bhp. 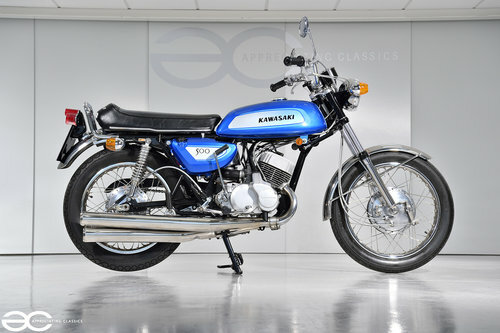 Anybody who has ridden any type of performance 2 stroke machine will verify, that they tend to be quite a handful, and that is all part of the character – the Kawasaki 500 Triple is no exception here, and soon gained a reputation. A reputation that really fitted in to this Rock & Roll era, making it a much lusted after machine. With a 1/4 mile time of around 13.2 seconds, it is still capable of upsetting many modern hot hatches, in 2018! This should give some indication of the shock and awe that this machine caused upon release, and it is easy to understand where the nick name ‘Widow maker’ came from. This example has receipts showing that an engine rebuild was undertaken as part of the restoration, in 2010. Within the receipts, it shows that Wiseco pistons were fitted, along with a crankshaft rebuild, plus the boring and honing of the cylinders, along with machining of the cylinder heads. Of course various new seals and gaskets were fitted at the same time. The gearbox was also shimmed, and selector forks ground and hardened whilst the engine was apart. Also the carbs were rebuilt as you would expect. In 2011 new clutch plates were fitted as well. Only 815 miles have been covered since 2010, and after a rebuild by one of the best in the business, you can rest assured this is a good one! The bike is currently in a de-commissioned state, having been part of a collection. We do have a video of the bike running prior to being de-commissioned, and of course we are more than happy to have the bike running for a new owner. As you would expect of a bike which has undergone such a thorough restoration, all running gear is in perfect working condition. The bikes still sports the original rear shock absorbers, which have been fully rebuilt, in favour of fitting aftermarket units. Like wise the forks were stripped and rebuilt. All brakes were renewed and operate just as they should do, and the tyres are also still as new. Chain and sprockets also appear to be in great condition, clearly having covered very little mileage.